"These are easy to make up ahead of time. They make a wonderful treat for the first night of camping. Kids love them too!" Leaving the peel on the bananas, slice each in half lengthwise. 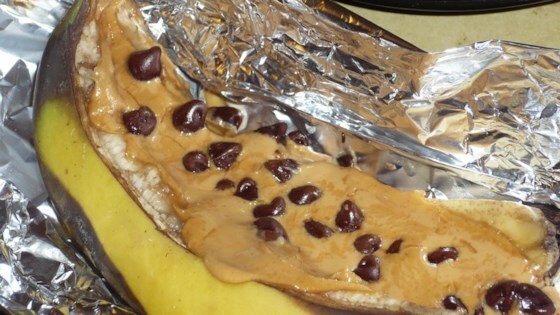 Smear the inside with peanut butter, and sprinkle with chocolate chips. Place the two halves back together and wrap each banana individually in aluminum foil. Cook in the hot coals of a campfire until the banana is hot, and the chocolate has melted, about 10 to 15 minutes, depending on the heat of the coals. Better if you use PB& Choc chips in banana and then for the top layer, use marshmallows. Cook at 350 in foil until marshmallows at toasted. Then eat with a spoon. Excellent! A little messy to serve, but the kids and hubby say it is well worth the mess!! VERY GOOD! My husband changed it by accident a turned out better. Instead of pb and choc chips he used an Oh henery choc bar cut in 1/2 lengthwise to fit into the banana . It was delish. It was great! We had this for dessert after camper pies and made them on the hot coals just as directed. Delicious and simple, and other than the chocolate chips, good for you, too.